While setting the broad strategic goals of US policy, the president would delegate implementation to US military commanders, diplomats and other officials, said the report. This shows that Trump is repeating the same division of labor which has, in his nine months as president, led his policymaking into self-defeating avenues – or worse – in one key security and foreign issue after another. Is Trump making a habit of devolving America’s most sensitive foreign policies on the generals and diplomats at his side, regardless of their fiascos in handling deteriorating relations with Russia, the stalemate in Ukraine, the unending war in Afghanistan, the no-win dispute with North Korea, setbacks against Iran and now an unresolved US role in Syria? DEBKA Weekly’s sources ask. In Syria, for instance, America has been stumbling in the war on ISIS and fallen back against Iran’s rising star. All the same, this week, the US appeared to be making an effort to climb out of its downward slide. It started on Saturday, Sept. 9, when two US-backed forces, the Syrian Democratic Forces (SDF) and the Deir ez-Zour military council announced that Operation Jazeera Storm to defeat ISIS in the Khabur River Valley (a tributary of the Euphrates) was underway. He stressed: “The very existence of ISIS poses a real threat to the civilized world…Our collective effort will defeat them,” he declared, and spelt this out: Coalition forces are to “advise and assist” the SDF during the Khabur River offensive, providing equipment, training, intelligence, and logistics support as well as precision fire. But, as DEBKA Weekly’s military and intelligence sources report, the grand buildup faltered as soon as it started. It was only on Tuesday, Sept. 12, that the first US-backed column was sighted moving out of Raqqa and heading for the Euphrates Valley. But even then, it disappointed expectations. 1. This force was a lot smaller than its Russian-backed counterpart – around 10,000 troops compared with twice that number of Syrian, Iranian and Hizballah troops. 2. The different militias and groups advancing along the American corridor were slowed down by quarrels, disputes and a refusal to knuckle under a single commander. DEBKA Weekly’s military sources report that the Arab Shamari Sanadid Brigade’s members don’t trust the SNF, which is dominated by the Kurdish YPG. This forces the Americans to deal with each commander separately. In contrast, their Russian-backed counterparts conducted themselves like a cohesive, orderly, disciplined army, ready to race forward under Russian, Iranian, Syrian and Hizballah officers acting in unison. Even so, this column was unexpectedly stopped in its tracks Tuesday and Wednesday (Sept. 12-13) when it faced a fierce counterattack from a supposedly vanquished ISIS outside Deir ez-Zour. 3. How real is the partnership forged between the Trump administration and the Kremlin for this groundbreaking anti-ISIS offensive? Our sources don’t have this information. But, we do know that, unlike Trump, Russian President Vladimir Putin takes care to micromanage events in the field in fine detail. The statement pointedly stressed that President Putin had sent his defense minister for on-the-spot, detailed coordination of the Syrian, pro-Iranian militias and Hizballah armies heading east to battle ISIS in Mayadin and Abu Kamal and the Syrian-Iraqi border. Shoigu made sure that Assad understood that he too was under Putin’s orders to adhere strictly to the agreed plan, else he and his allies would forfeit Russian air support. After talking to Assad, the Russian defense minister flew to Tehran Wednesday, Sept. 13, with a similar message, as DEBKA Weekly’s sources report. Clearly, Putin has no intention of letting Assad, Iran’s Middle East commander, Gen. Qassem Soleimani, or Hizballah’s Hassan Nasrallah call the shots and seize control of the events playing out on the Syrian-Iraqi border. And when he next discusses the Syrian question with President Trump, the Russian president wants to show he is in control. 4. Trump will not have that advantage, having left it to his generals and diplomats to negotiate the joint operations going forward with the Russians, without the White House getting involved in the implementation of his far from clear-cut strategy. 5. This aloofness also leaves him with few aces to play against Tehran. Putin stepped in to keep a tight rein on Assad, but also to make sure that the Syrian ruler obeys Moscow, not the Iranian commander, as the joint, multi-lateral military operation moves forward. Gen. Soleimani, too, reports daily to supreme leader Ayatollah Ali Khameini in Tehran and collects his orders on how to proceed next on the battlefields of Syria and Iraq – and, lately Lebanon, too. The ayatollah, like Putin, keeps his hand on the levers of every move made by his generals, diplomats, underlings and proxies. He and Putin are both well-armed to play chess against each other on the Syrian board. Trump, too, can’t afford to leave the detailed work to underlings, if he hopes to succeed in his new strategy of “more aggressive responses” for keeping Iran, its Shiite proxies in Iraq and Syria and terrorist stooges in check. 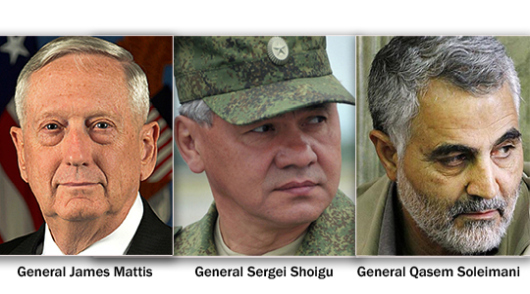 As things stand now, Jim Mattis, Sergei Shoigu and Qassem Soleimani are determining the course of events in these arenas. They were sidelined this week by the debate in Washington over a related issue: Should the US President sign another 90-day certification of Iran’s compliance with the 2015 nuclear accord – and therefore its entitlement to sanctions relief – when the next deadline falls due in mid-October? He has indicated he may not.